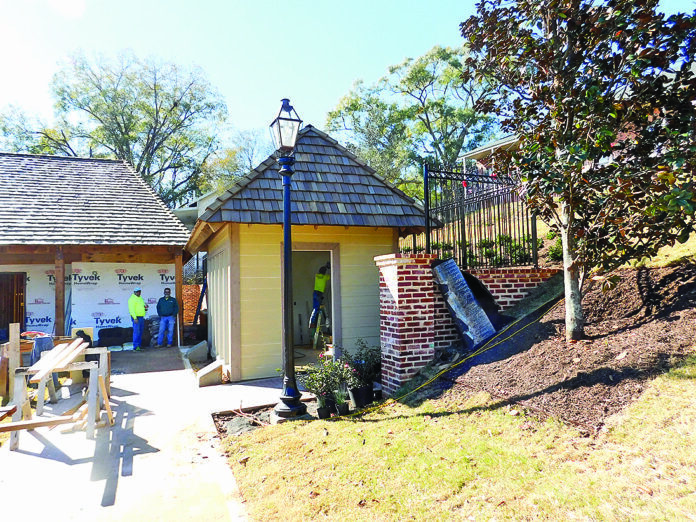 One of the added benefits of the downtown riverbank renovation is the construction of a new Santa’s House, as well as an adjacent restroom and boat launching area on the south side of the riverbank. Santa can be found at his new home every night from 6 p.m. – 8:30 p.m. from Sunday, Dec. 3 until Saturday, Dec. 23. Parents are welcome to take pictures of their children with Santa at no cost. The new Santa House is almost twice as large as the previous one, with approximately 200 square foot of space. The house has a concrete floor and is constructed in the same design and with the same wood shape shingles on the Riverbank Stage and the adjacent bathrooms. Santa’s new house will be heated and cooled and have benches inside for those waiting to give Santa their Christmas lists. Once inside the Santa House, Santa’s chair will be facing Front Street so that when the children are face to face to Santa, they can also look out to Cane River through the nearly five foot tall glass pane windows. With Santa seated close to the windows, entrance and egress to the building will be a straight shot through the center of the 14 foot wide building. The Santa House will be the centerpiece of a courtyard area featuring the bathrooms, a boat launch area and outside seating. There will also be a concrete walkway to Santa’s house and the other facilities in the courtyard area. The original Santa’s House was a project of love roughly 50 years ago by the late Jeanette Katherine Maggio. She had the small 8×8 structure built in memory of her son Barry. They had gone to Shreveport when Barry was 4 to see Santa but because of the long line of children, Barry was not able to speak with Santa. However, he told his mother, “That’s alright Mama, I’ll see Santa Claus next year.” Tragically, soon after that, he died in an accident. His mother vowed to make sure that every night during the next Christmas season no child would every have to wait until next year. She purchased the Santa outfits and candy canes that were distributed to children who visited Santa each year. Santa’s House has not missed a year being open since then and generations of area children have enjoyed the experience of sitting on Santa’s lap.